Hideo Kojima is looking into an outside studio to handle a possible remake. 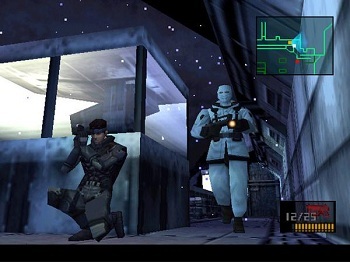 While the Metal Gear franchise actually dates back to the late 1980s, the franchise as we know it today saw its foundations laid down in Metal Gear Solid, released on the PlayStation in 1998. A classic of its time, it was unprecedented in its implementation of both stealth gameplay and cinematics. That being the case, you might forgive modern gamers for looking back at it and seeing more rough edges than smooth ones. Just from a visual standpoint, games on the original PlayStation tend not to have aged all that well. Perhaps recognizing this, series-creator Hideo Kojima has shown interest in remaking Metal Gear Solid using the Fox Engine, which is currently being used to make Metal Gear Solid V: The Phantom Pain. During an E3 roundtable a fan expressed their desire to see remakes of both Metal Gear Solid and Metal Gear Solid 2. Responding to this, Kojima stated that he was already looking into an outside studio to remake Metal Gear Solid with the Fox Engine. While unbridled excitement is the first thing that comes to mind with this news, a potential Metal Gear Solid remake also comes with questions. Most important is what a potential remake would retain from the original game and what it would change. The setting of Shadow Moses island, for instance, is kind of small when compared to locations in later games. While purists might want nothing more than a graphical and gameplay update, it could arguably be a good idea to expand on the game's setting as well. Also, the return of David Hayter would be a must. Keifer Sutherland will undoubtedly do a good job in The Phantom Pain, but the original Metal Gear Solid sans David Hayter as Solid Snake? That there be blasphemy. Updated: According to Hideo Kojima, the source article that originally published his comments pointing to a Metal Gear Solid remake had made a mistake in its translation. "There's a rumor about remaking MGS1+2, but that's not true," said Kojima. He stressed that while he'd love to see a remake, his studio has far more present priorities, namely Metal Gear Solid V. Nonetheless, he added that he "wouldn't mind if a talented creator from an outside studio could [make] this happen." So you never know. A Metal Gear Solid remake may not be in the cards currently, but the future could always change that.